Express Yourself! provides up to 10 hours of new KIBO activities based on the Expression Module. 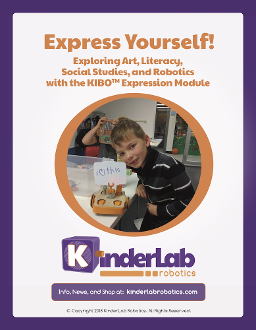 This research-based curriculum booklet supports the KIBO Expression Module with art, literacy, and social studies connections. Students will create interactive book reports with the whiteboard; explore other countries and decorate their flags for a robotic world parade; and create interactive self-portraits. Copyright © 2014-2019 KinderLab Robotics, Inc. All rights reserved.